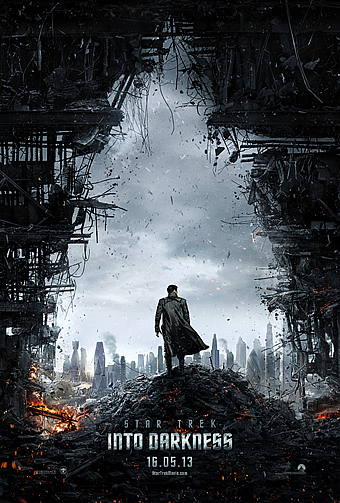 Synopsis: In Summer 2013, pioneering director J.J. Abrams will deliver an explosive action thriller that takes Star Trek Into Darkness. When the crew of the Enterprise is called back home, they find an unstoppable force of terror from within their own organization has detonated the fleet and everything it stands for, leaving our world in a state of crisis. With a personal score to settle, Captain Kirk leads a manhunt to a war-zone world to capture a one man weapon of mass destruction. As our heroes are propelled into an epic chess game of life and death, love will be challenged, friendships will be torn apart, and sacrifices must be made for the only family Kirk has left: his crew. Rebooting a pop culture cult classic with a 50-year legacy is no mean feat, but successfully doing so twice while juggling loyalists’ expectations and attracting fresh eyeballs is an accomplishment. 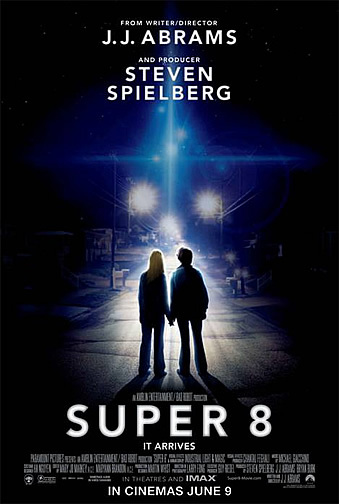 Director J.J. Abrams’ 2009 take on the original science fiction TV series more commonly popular among a niche audience transformed it into fun mainstream fare, producing a box office hit that surpassed all previous outings. Remarkably, most of its success was driven by overseas sales, an achievement considering that Star Trek films are known for not travelling too well beyond American shores. In this 2013 follow-up, we take off with a sprint in middle of a mission on an alien planet. 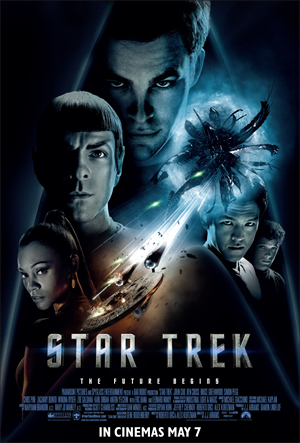 Captain James T. Kirk (Chris Pine) and Dr Leonard “Bones” McCoy (Karl Urban) are escaping from an aggressive horde of indigenous beings on the brink of civilization. 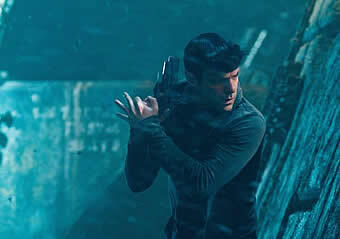 In the meantime, resident paragon of reason and truth First Officer Spock (Zachary Quinto) is tasked with suppressing an erupting volcano with a freezing device. 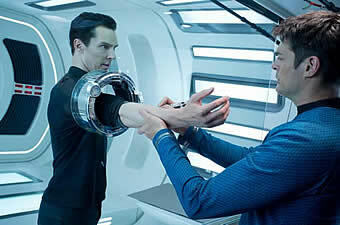 This prologue will feel like déjà vu for viewers who caught the nine-minute trailer preceding the IMAX screenings of The Hobbit back in December. While Spock navigates the complicated waters of a committed relationship with romantic interest Uhura (Zoe Saldana), Kirk lives it up as a bachelor, bedding and picking up attractive aliens at his convenience. 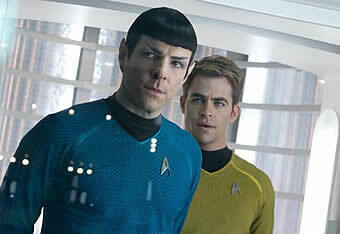 The core dynamic between the two leads is quickly established, playing Kirk’s brawn and passionate “leave no man behind” approach against Spock’s adamant reliance on rules and obligations. What makes a great leader? It may be the unlikely melding of these two extreme perspectives. Despite the overall success of the mission, Kirk’s superior / mentor Rear Admiral Christopher Pike (Bruce Greenwood) reprimands him for disobeying direct orders, after Spock submits the mission report without his knowledge. This results in his demotion, but the arrangement turns out to be temporary when the bombing of a secret Starfleet intelligence facility and subsequent acts of terrorism throw the Federation into chaos. 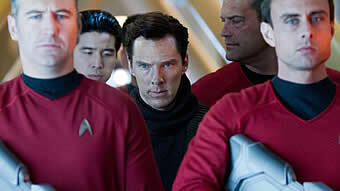 The adversary is identified to be a certain ex-officer John Harrison (Benedict Cumberbatch), who has gone into hiding in hostile Klingon territory. An enraged Kirk regains command of his ship, the USS Enterprise, and in typical fashion goes right into the fray on a mission to kill. Armed with 72 undetectable missiles of questionable origin and an entire ship crew advising against the operation, there is every indication that things will take a dangerous turn. With the help of the alluring weapons specialist Dr Carol Marcus (Alice Eve), the crew engage an opponent who’s practically the equivalent of Superman. [This review aims to be spoiler-free, but it suffices to say that many online fans have already sussed out the antagonist’s identity]. 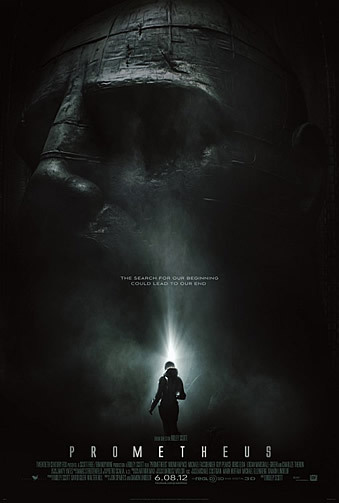 Chronicled on an alternate timeline, Into Darkness is a product of creative tinkering with familiar characters while retaining the spirit of creator Gene Roddenberry’s stories. It’s easy to draw parallels with today’s newspaper headlines and political discourse with its accompanying moral quandaries – Star Trek storylines have traditionally been analogies for real-life current affairs – be it the morality of weapons of mass destruction, what constitutes justice, the costs of revenge or whether the utilitarian reasoning is necessarily the best way forward. Although the motivations of individual characters receive screen time, this doesn’t translate to greater clarity. Cumberbatch’s character in particular could have used a more compelling and convincing backstory, considering how the entire movie (even the promotional material) apparently revolves around him. While the big reveal was delivered well by the British thespian, more attention could have been paid to fleshing out the trigger points and rationale. Into Darkness is polished to such a high shine that it’s almost blinding: Gleaming spaceships calmly sail against a backdrop of black space and the impeccably tailored uniforms are so crisp it’s distracting. Perhaps even more distracting are the lens flares reflecting off nearly every frame, which felt artificial when used so liberally, despite fitting the space travel premise by approximating solar glares and connoting “hi-tech. That said, the action is first-class, with thrilling aerial chases, fight scenes and set pieces of total destruction that justify the price of an IMAX ticket. Scene-stealing star of the movie Cumberbatch is the cool personification of warped morality: empty of empathy, brilliantly manipulative and ruthlessly efficient both mentally and physically. Having bulked up considerably since his last outings in War Horse and Tinker Tailor Soldier Spy, he rises up to the occasion for his numerous action scenes and fully deserves the praise his co-stars have lavished on him. Quinto delicately portrays Spock’s emotional growth and journey towards maturity, spurring a few memorable laugh-out-loud scenes. Suitably rough-around-the-edges, Pines’ earnestness is put to good use as a leader whose first instinct is to protect the ones he loves despite his heavy responsibilities. 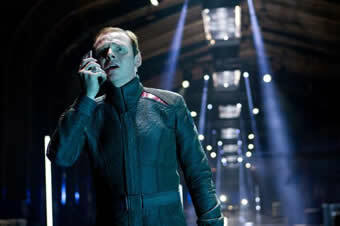 As Abrams has shared, the film wasn’t designed solely for die-hard Trekkies but targeted to movie fans in general. 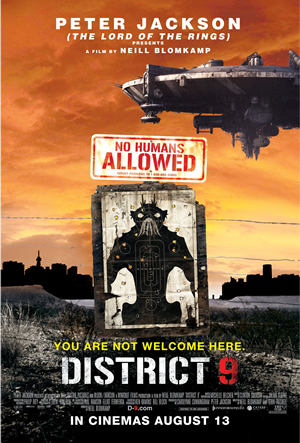 It establishes itself as a standalone movie or it can interpreted as part of the overall series, ultimately appealing to the mass audience as a whole. One shouldn’t let unfamiliarity with the original series hinder a chance to catch this.